“He hasn’t played anything I recognise tonight, you’d have to be on something to enjoy that.” There’s a lady chattering disparagingly and laughing about John Cale’s special show in St David’s Halls bar as I cue for mid-set refreshment. And I can’t help but think she’s entirely missed the point. This isn’t an evening of hits, but a special occasion and a memorable performance because of it. Save for a rendition of ‘Sunday Morning’ tonight John Cale doesn’t give us what we want but what he thinks we need. You wouldn’t expect anything else from the man who left Wales for the US in the 1960s, joined avant-garde art rock legends The Velvet Underground and became a figure whose musical and artistic influence would last in his homeland (Gruff Rhys is here and he’s not the only one from the Welsh music scene present). Now dipping into his 70s, decked in black, his angular withered features like the jagged edges of the black forest mountain bordered by hawkish grey hair. Tonight John Cale is like an anchor in an ever-revolving cast. He is framed and backlit by a screen that emerges from endless darkness of the background, depicting appropriate snippets and video montages, flanked by choirs, string quartets and his own band who fracture his solo work and represent it in modern, ominous, masterful tones. Opening with the pearless ‘Time Stands Still’ – a whirl of skittering beats and Cale’s unmistakably mournful vocals, ominous and plundering notes. Tonight his set is heavy with material from Cale’s new M:FANS record, a modern reworking of his own 1982 album Music For a New Society. The ghostly tread of ‘Close Watch’ is a re-crafted and industrial electronic version of the song that is haunted by insomnia and loss ‘I can’t live without you’ he sighs, as electronic tapestry hurries forth and blinking lights on the screen briefly light up his pointy, greying features. 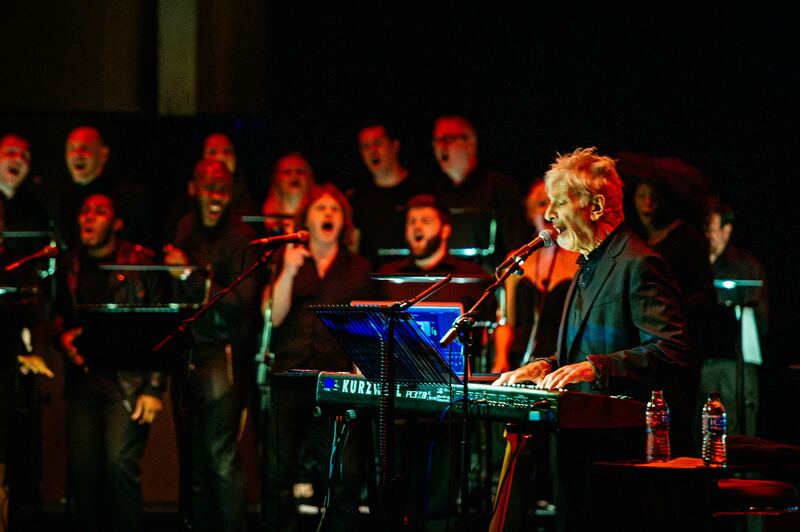 For “If You Were Still Around” one is haunted by those he is lost, Warhol and most recently Lou Reed, a crumpled letter to them drawn in futuristic baroque its choruses enlivened by the first appearance of the night from the House Gospel Choir. The surrealist strut of ‘Things’ has a wicked glint of wit and a kicking beat, that his buddy Reed would be proud of. At one point someone shouts out ‘Are you enjoying Wales John? !’, feigning an inability to hear Cale retorts ‘Am I rejoining Wales? I rejoin Wales every time I come back here!” to much mirth. So he is joined by two of Wales’s most well known. Inscrutable and withering John doesn’t speak between songs this evening, whether hunched over his keyboard like a grandmaster or strumming at his guitar, he’s giving himself but not playing the game. Little wonder for this art school graduate, who by a strange quirk of fate found himself at the centre of New York’s Factory scene in the late 1960s and later became a friend to David Bowie. Since then he’s continued to push and evolve and experiment, he laid the framework for the reworked version of ‘Hallelujah’ that we all know today and his memorable orchestral album Paris 1919, but throughout his work he’s continued to examining the murky depths of society and the mind.“Gave up the ghost of yesteryear, nothing could be done.” he sings on standout ‘Wasteland’ framed in apocalyptic and disturbing imagery of famine and war. He ends the night stood shoulder to shoulder with his entire cast of players and performers, with a Welsh sheep clutched in one hand patting his heart with the other. Nobody (bar maybe the lady) who left tonight was in any doubt that they’d witnessed one of Wales’s most unique, challenging, elemental and enduring voices. There was no mid-set break. Gruff Rhys was on holiday with his children in France. Don’t know where you studied music, but “almost soprano” ??? 1. I didn’t say there was a mid-set break, I took one to grab a drink. 2. I saw Gruff Rhys going in before the performance started, so unless my eyes deceived me(and he’s pretty recognisable) he can’t have been.